For much of my life I have been told the world is non-forgiving, not fair, and cruel, and that everyone fends for themselves. It created a worldview that the world is a terrible place. This health tip of the week is not really even about whether the world is “bad” or “good” because clearly it is both. There is “good” and “bad” in everything. I do believe, however, that in order to truly improve our quality of life and appreciate our blessings, we must change the idea that the world is all “bad.” If we have the mindset that the world is a terrible place ready to devour us alive, then we will make sure that this self fulfilling prophesy is true. The whole idea of this health tip of the week is to change the perspective that many of us have about the world. The world is so intricate and beautiful and interconnected and once we become aware of this, the whole life experience can be and will be that much better. Every aspect of the world we inhabit is related to each other in some way or another. Smile at the world and the world will smile right back for this health tip of the week. Often times we plan vacations to go half way across the world to see different amazing sites and experience all the exquisite things that nature has to offer without realizing that there are so many beautiful things right in front of us. In a fast paced society we often zoom through things without experiencing the sublime scenery around us. If we simply open our eyes, slow down a little bit, and take a deep breath we will realize how much we have been missing out on. Change your perspective and you change the world. Smile at the world and the world will smile right back at you. In summary, this weekly health tip is about changing the way we think, experience, and look at things. Next time you take a step outside, go for a walk, or simply get in your car to drive to your destination, open your eyes to the beauty and love in the world. Take a minute or two to slow down to really experience how awesome the world can be. Realize that the world is not some evil place that wants you to fail and that if you change your mindset to one full of love and compassion, that your life will change drastically for the better. 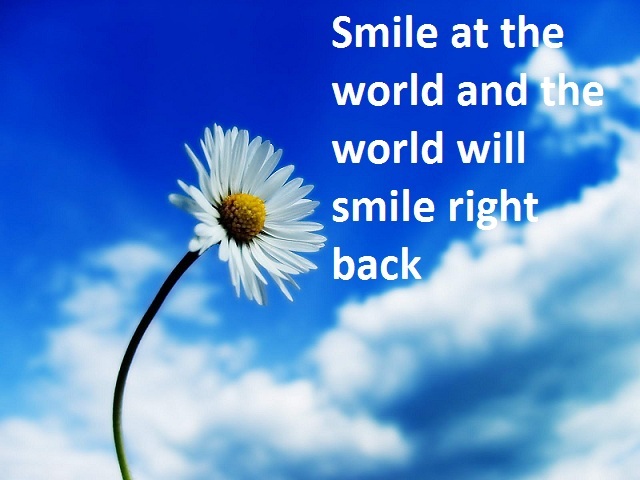 Just remember that if you smile at the world, the world will smile right back. Next post: Do Carbs Make You Fat? | What Are The Causes Of Weight Gain?